The mission of North Carolina Theatre for Young People is to produce plays to engage young audiences, K-9, in the art of the live theatre. We strive to present highly mobile and flexible productions that can be presented effectively in a variety of performance settings. Our plays are chosen from the best available to include a variety of styles and content in order to aquaint our audiences with the richness of theatre for young audiences literature. We seek to encourage and foster the development of new scripts, develop residencies in creative drama and theatre for schools, and explore the theory that theatre-going by young people will contribute to the development of adult audiences of tomorrow. Since its start in 1962, NCTYP has reached well over one million children with formal, on-campus stage productions and touring shows that have gone as far as rural Maryland and Washington, D.C. The touring shows alone touch more than 15,000 children every year. 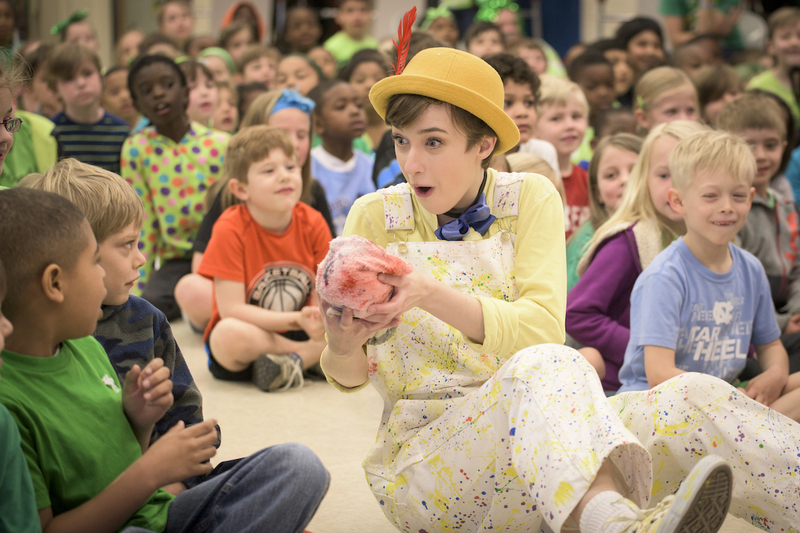 The North Carolina Theatre for Young People (NCTYP) exists to celebrate the art of live theatre for young audiences, to enrich the lives of young people and their families, and to connect the University of North Carolina at Greensboro with the community. The North Carolina Theatre for Young People realizes this vision through: producing plays; facilitating outreach programs in schools and the community; and educating Theatre for Youth graduate students to apply knowledge in practice in area schools and community organizations. A core value of NCTYP is to elevate the status of young people in the broader culture by engaging young voices in dialogue surrounding theatre arts. This is achieved through a variety of means: post-production workshops, in-school drama and theatre residencies, and selection of literature that reflects authentic experiences of young people. Additionally, NCTYP believes in cultivating relationships with young people in their home environments. To this end, NCTYP produces a touring production every year that is performed in over 24 venues in the region. Play selection includes a broad range of titles; pulling from the existing canon of literature for young audiences while also encouraging the development of new plays, NCTYP offers main stage and touring opportunities for new works. The North Carolina Theatre for Young People aims to embrace all community members in its offerings. NCTYP believes in promoting diversity, inclusion, and acceptance. Producing work for Deaf audiences, bi-lingual audiences, and refugees from around the globe, NCTYP works to educate, expose, and expand its audience base. Founded in 1962, the North Carolina Theatre for Young People has reached well over one million young people with fully mounted main stage productions as well as touring shows that have traveled as far as rural Maryland and Washington, D.C. The touring shows alone engage more than 15,000 children every year.